As a full-service marketing agency, we partner with brands and agencies to launch promotional campaigns that drive results. Our scalable infrastructure and decades of experience allow us to efficiently implement the right tools at the right time for the right target. If you’re looking to connect with your customers through digital marketing, we can help. We ensure businesses and brands get their brand message out and connect with their target in a unique way by creating engaging campaigns that drive results. When you give us the opportunity to strategize, plan, and execute your next online digital promotion, the Fielday difference will make all the difference. Our team will help you manage the rules and regulations to make sure your online digital promotion is legal and compliant. We’ll work with you to craft rules, handle tax document requirements, and ensure that the prizes get to the winner on time, every time. 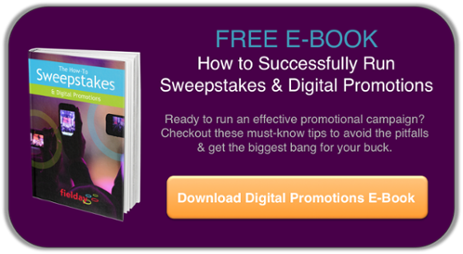 There is no better way to excite your target consumer than with an engaging sweepstakes or contest. We’ve successfully executed numerous social promotions (Instagram, Twitter, Facebook, etc. ), as well as promotions that live directly on your brand’s website or vanity URL. As marketers, we use targeted tactics to amplify your reach through the social channels that attract your customers. Whether you’re considering outrageous games, instantaneous prizing, text to win, hashtag scrapping, or other methods, we can implement a program that will create the greatest impact for you and your customers. Ready, set, Fielday! We can’t help it, we love a fun contest. Contests are great for creating engaging content, encouraging fan participation, and converting customers. If you’re looking to run a contest, we are experts at contest development, rule creation, and judging criteria establishment. Looking for a tool to help you judge and rank your winners? Our system can efficiently and seamlessly execute any type of User Generated Content (UGC) promotion. If you want to take your UGC program to the next level, consider gamifying the consumer experience. We’ll help you develop a strategy to get the most out of your digital promotion. Fielday is a one-stop shop when it comes to prize sourcing and the fulfillment of digital or physical prizes. We will assure the right prizes get to the winners on time and as an extension of your brand. Our full-service fulfillment department gets prizes out faster so your customers get their prizes sooner than ever before. We can also provide you with real-time tracking so you know exactly when your prize is delivered.